Now your book is really at the starting line. The PDF book files delivered from your publisher have been transformed into a print-ready format in the printer’s pre-press department; printing is just minutes away. 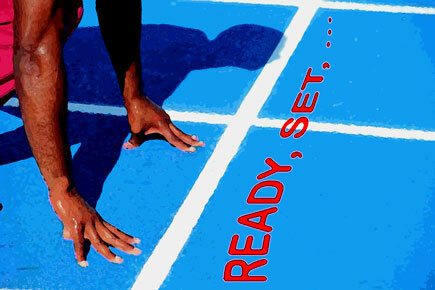 Ready, set, … . Well, no, wait a moment. As mentioned in my last post, specimen proofs must first be printed off and sent to your publisher for approval. These allow publishing staff to check that text pages are ordered correctly, cover colours match, etc. Only after the approval of these printer’s proofs can the actual printing of your book proceed. This proofing process is one that you will not be involved in – unless, that is, yours is an art book or similar highly illustrated work where fidelity of reproduction is paramount; here it might be appropriate for authors with their superior knowledge of the subject to be consulted. Just what these printer’s proofs look like depends on the type of printing intended and the type of equipment the printer uses. If it is a digital, print-on-demand job, then what the publisher is likely to receive is a printed copy of the book, i.e. looking exactly like all subsequent copies would look like. However, if it is a traditional lithographic printing job, then – unless these proofs are machine proofs (more about them below) – the printer’s proofs received will be quite different and look nothing like the final printed book. 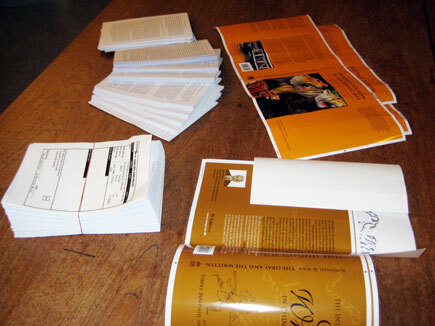 The book pages may be in loose-leaf form or – more likely – gathered in signatures (in which case the proofs take the form of a bundle of booklets). Such page proofs may be called blues/blueprints, diazos, ozalids and Vandykes, depending on the technology that produced them. In all cases, however, because these proofs are printed on something like an ink-jet printer (with all sorts of compromises being made with regard to colour, resolution, etc. ), the proof print is only indicative – something to check that nothing has been imposed upside down or out of sequence, for instance. Even the cover proof tends to be printed using an ink-jet printer or similar but usually the quality is good enough to flag up any major problems. If it’s anything like usual, the printer’s proofs for your book will arrive by courier at the door of your production editor and s/he will have only a short time to check these. The printing presses are not actually throbbing there, waiting to start on your book (no, there’s dozens of other jobs to be done, with presses often running 24 hours a day). But there is an air of urgency and no doubt your production editor will be praying for a clean sheet, no errors. In your case, everything is fine; the proofs are approved and the printer gets the go-ahead to print. Now, finally, all systems are ‘go’. Time to descend into Hell’s Kitchen. This entry was posted on Saturday, June 26th, 2010 at 3:27 am and is filed under Finances, Printing, Publication process. You can follow any responses to this entry through the RSS 2.0 feed. You can leave a response, or trackback from your own site.